Carnivorous plants are found in many different habitats and climates, growing in nutrient poor conditions where they can supplement their nutrient uptake with limited competition from other plants. These plants have evolved several techniques for trapping and digesting their pray. They produce mucus or oil-based glues which act as flypaper, slippery tubes or pots which stop the retreat of curious insects, and even traps which snap shut, like the famous Venus flytrap, trapping prey that walk along the surface of their adapted leaves. The prey which these plants feast on is also quite varied. At one end of the scale the bladderworts (Utricularia) pick off nematodes and small aquatic invertebrates, while butterworts (Pinguicula) manage little more than fruit-flies and pollen. The pitcher plants, such as Sarracenia and Darlingtonia can handle altogether bigger prey such as flies and wasps, while the tropical pitcher plants, the Nepenthes, can reach giant proportions and have been found holding the remains of birds, lizards and rodents. 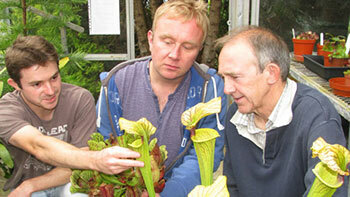 At Treborth we grow over 100 species and cultivars of these curious plants. Tropical specimens can be found in the Orchid and Tropical houses with plants from more temperate parts of the world, even from here in the UK, being grown in the Carnivorous Plant House. Many carnivorous plants grow in temperate climates and undergo a winter dormancy, waiting until spring to produce flowers to attract pollinators and traps to attract food! The North American pitcher plants (Sarracenia and Darlingtonia) have now produced an array of tall, narrow tubes to trap curious flies, the sundews (Drosera) and butterworts (Pinguicula) are covered in sticky, fly catching glue and the Venus flytraps are ready to snap shut on whatever lands on them. This year we are also busy building new displays in the Carnivorous House and also for our tropical species and will post updates on their progress.